ATO will likely be the most popular use for this pump. 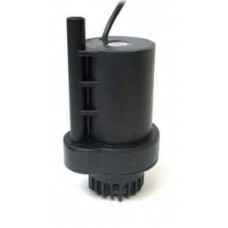 And unlike many wimpy pumps out there, the PMUP has enough pressure to push water up 14 feet vertically, it can even move the water up from one floor below. This means you could put your RO water storage in your basement or downstairs in a utility room and it could still pump it up to the tank. It also has a vertically oriented design with a bottom intake and top output that is perfect for use in jugs or other RO containers. Just drop it in! The PMUP is not just for ATO. It is also a great pump to use for running your various reactors bio-pellets, carbon, GFO, or even the two-stage combo unit from BRS you see here. The PMUP uses less than 20W of power so it is a very efficient way to run reactors and adds very little heat to your aquarium. We’re certain there will be many other uses found for the PMUP we’ve not even considered yet. The PMUP Has a smooth, 3/8″ (9.5mm) output that will easily connect to silicon tubing or standard push-fit connectors like the one shown in this image.